Both Apple and Verizon began offering existing Verizon customers the ability to preorder the forthcoming CDMA iPhone 4 right on schedule Thursday, with a delivery date of Feb. 10. In Apple's online store, the AT&T and Verizon models of the iPhone 4 now appear side by side, as customers are invited to "select your iPhone and carrier." Pricing for the handset is identical, with the 16GB model running $199 with a two-year contract, and the highest capacity 32GB model $299. The previous generation 8GB iPhone 3GS has been pushed down the page as a result. It is still offered for $49 only through AT&T. 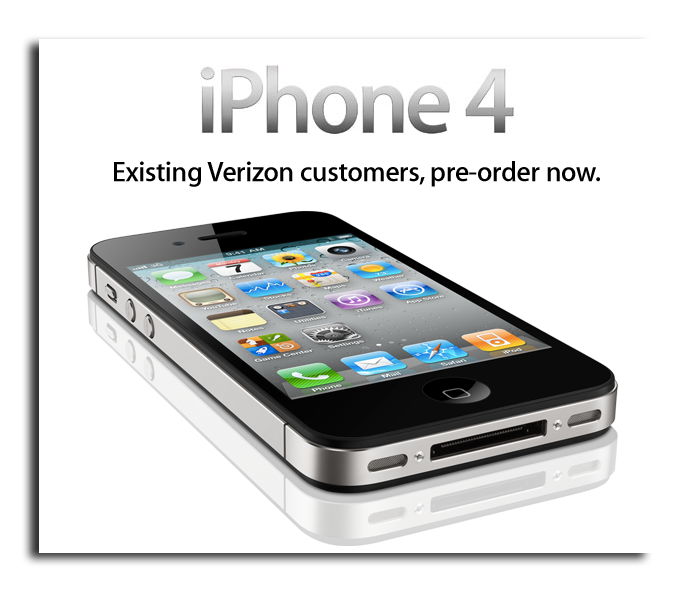 Currently, only existing Verizon customers can preorder the iPhone 4, set to launch on Feb. 10. And the carrier expects such great demand, it has even asked its employees to wait to buy the smartphone so that it will be available for regular customers. Verizon customers will be able to buy a plan with 450 "Anytime Minutes" for $39.99 per month, or 900 minutes for $59.99 per month. The unlimited voice plan is $69.99 per month for an individual. The two-year contract also requires a data plan, which is $29.99 per month for unlimited access. An additional $20 per month offers the 3G Mobile Hotspot feature, which offers 2GB of capped data for external devices. Text messaging can be pay-per-use, at 20 cents per text or 30 cents per picture or video. Plans start at 250 messages for $5 per month, 500 messages for $10 per month, or unlimited messaging for $20 per month. Verizon Wireless Family SharePlans are also available for up to 5 lines, and can be bought through Apple Retail Stores and Verizon Wireless. They offer 700 minutes for $69.99, 1,400 minutes for $89.99, 2,000 minutes for $99.99 and "Nationwide Unlimited" for $119.99. On Wednesday, Feb., 9, all qualified customers will be able to order an iPhone 4 on Verizon through the Apple online store for delivery, or reserve for in-store pick-up beginning Feb. 10. The Verizon iPhone will be available to all qualified customers at 7 a.m. local time on Thursday, Feb. 10. The new CDMA handset will also be available at more than 2,000 Verizon Wireless Communication Stores across the U.S.